We made it! The week of publication of Gluten-Free on a Shoestring Bakes Bread is complete! *Phew* You came to the Live Facebook Q&A (fun, right?). You’ve posted photos of the new book in your beautiful hands. Then you even posted photos of the perfectly-shaped, perfectly amazing gluten free bread you made, in your own kitchens and with your own hands. Every one of those photos has a permanent place in my memory. It feels like it took forever to get here, but now that we’re here, it feels like a dream! In these early days and weeks, I’ve had the help of some wonderful websites in getting out the word about the Gluten Free Bread Revolution. They’ve helped to show you … that (with a little help from you all) gluten free bread baking will NEVER be the same. Gone are the days of weepy, cookie-dough-style gluten free bread dough. Traditional yeast bread baking will always have some very soft, high-hydration bread doughs (see below for the English Muffin Bread situation), but if the dough is not super soft by nature, it’s not super soft in gluten free. At least not any more! Refinery29.com reprinted the recipe for Gluten Free Cheese Bread from the new book. Parents Magazine shared some of my holiday tips, plus my recipe for Gluten Free Soft Olive Garden-Style Garlic Butter Breadsticks (and so did Yahoo! Shine). Mel of Mel’s Kitchen Cafe shared my recipe for Gluten Free Hawaiian Rolls (and then I went and shared it again here on the blog, so I could show you step-by-step photos). Mel is an amazing, expert yeast bread-baker, but had never made gluten free yeast bread before. And she loved it! She is just … the very, very best. Look for more websites and news outlets talking about our brand new bread in the coming weeks. I will keep you posted! Not only did these amazing websites help to get the word out about Bakes Bread, for which I am super grateful. They shared the recipes before the book was even published, which was really wonderful, since that meant that you could get a jump on things! The waiting was killing me, you know? 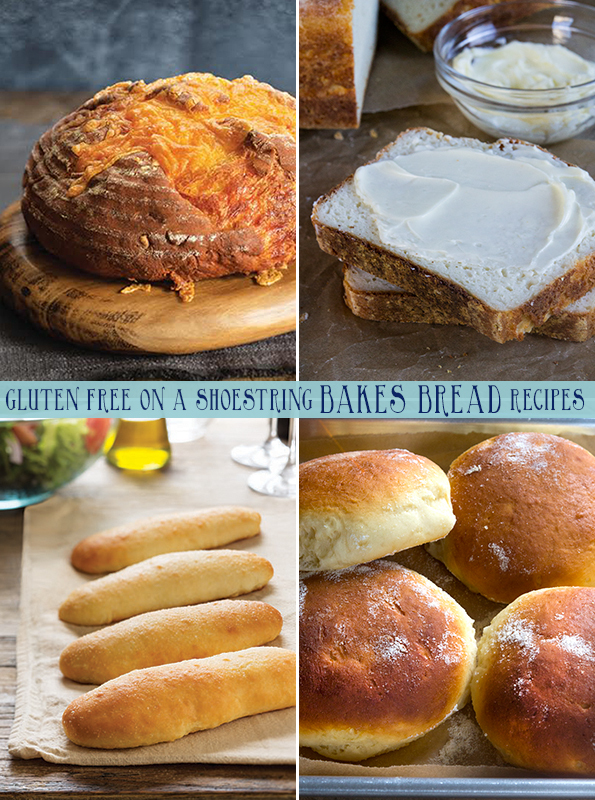 Without further ado, here are 4 gluten free breads from the new book. Aren’t they beautiful? Gluten Free Cheese Bread: This bread is, simply stated, a showstopper. Tender but toothsome, and loaded with cheddar cheese, this loaf makes the best grilled cheese sandwich you’ve ever had. It also makes a fabulous appetizer, just cut into simple chunks. Imagine this on your holiday table? I just got chills (quite literally). Gluten Free English Muffin Bread: This is a recipe from the new book that hasn’t been shared anywhere else. Yet. Watch for it to appear on the blog early next week. I chose it as the next preview recipe to share with you for a few reasons. First, it is one of the few yeast bread recipes in the book that don’t call for an extended first rise in the refrigerator, so you can conceive of it and slice into it a couple of hours later. Second, since English Muffin Bread, by its very nature, is very, very wet (even when it has gluten in it), it isn’t the sort of loaf of bread that you shape. So no worries there if you’re concerned about shaping. Finally, it is just so, so good. It’s incredibly tender and springy, and truly makes some of the best sandwiches I’ve ever had. It’s a really, really simple list of ingredients, too (no eggs, no butter, just some milk as an ‘enrichment’), which doesn’t hurt. I can’t wait to share it with you next week (including tons of step-by-step photos)! I think maybe I’ll post the recipe on Tuesday, and then we’ll do another Live Q&A on Facebook on Tuesday night, December 17, 2013, at 8:30 pm EST. Gluten Free Soft Olive Garden-Style Garlic Butter Breadsticks: Another simple recipe, these soft breadsticks are a dead-ringer for the ones you thought you’d never have again from The Olive Garden. They have only one rise, since the flavor comes from generous brushings of garlic butter, not from yeast development. They do require some shaping moxie, so you might want to watch my video of the scrape and fold technique to help get you comfortable working with the dough. But you’ll do great! Just remember, bread-baking takes practice. And even when it doesn’t look perfect, it’ll usually taste great. Just keep going! Gluten Free Hawaiian Rolls: You already know how I feel about these. If you don’t go ahead and make some, my head just might explode! I mean, just look at them. Make them as directed in the book as dinner rolls, or make them into sandwich buns. With ham and cheese …. mmmm….. Wondering how to shape round rolls? See me do it first here! I’m there with you. Always. I’m afraid it’s not, Shruti. If you read the ingredients list on that, you’ll see it has sugar and a number of other ingredients. You need pure powdered pectin. No additives. The long awaited book looks so inspiring and exciting. I bought the exact ingredients mentioned in the book. I started with the first recipe, Lean White Sandwich Bread. I’ve made it four times, following instructions exactly. Each time, I’ve gotten a 3″ high brick. The starter rises as described in the book. The dough rises to double in the fridge in about an hour, but I wait to use it for 12-18 hours. I shape the dough as instructed, with a bit of trouble getting the 7″ side to fold over 2″ on each side. I rise the dough for 1 1/2 hours, and it rises only to the top of the pan. I’ve tried waiting longer, but it doesn’t rise any further. I bake the dough as instructed, starting in a cold oven. The dough does not rise in the oven; in fact it shrinks a bit. HELP! I’d dearly love to have a decent bread for Christmas morning and dinner without having to go back to the old GF bread methods and recipes. Your revolution sounds so great, but so far it hasn’t panned out :) for me. This is getting expensive (Expandex, whey, Better Batter flour) and very frustrating. Green, I understand that you are frustrated. I hope you’ll hang in there. I’m afraid I can’t do anything about the cost of ingredients, as it is a very, very well-tested recipe and will work beautifully when it is done as written. You have given me some of the details of what you’ve done that you remember, but it is still hard for me to tell where you went wrong as I’m not there with you in the kitchen. From what you have said, I have a couple guesses, and they are covered in the troubleshooting section of the book, pages 25-28: 1. If the dough is rising during the first rise in the refrigerator, but not in the second rise, it is almost certainly due to your rising environment. The refrigerator has a consistent rate of temperature, which is the most important feature for rise (other than keeping the rising temp above freezing and well below 140°F, the kill point for yeast). I would recommend turning on your oven to about 300°F, and placing the covered, rising loaf in the second rise on top of the stove (NOT inside the oven), close to the back of the oven, where it is warm. Or, you can try the microwave proofing method I recommend on the blog and in my first book. 2. Your oven is not properly calibrated, and/or takes an extremely long time to warm up. If that is the case, please please use an oven thermometer, and start with a preheated oven of 300°F, and then raise the temperature to 350°F when you put the loaf in. Poor oven performance almost certainly accounts for the failure to rise in the oven. The dough does rise to the top of the pan, very slowly (the old recipes rose higher and faster), but then it seems to stop rising after about the first hour. It rises no further in 2 hours than it does in 1 hour, Then it doesn’t rise at all in the oven during baking, Something is happening near the end of the second rising and/or during baking to stop the rising process. I have wall ovens so I can’t do the stovetop method for rising. My oven has a proof function, but it doesn’t get hot enough to kill the yeast. I just timed the heating time — 11-12 minutes to get to 300 degrees. Too long? The oven temp should be correct. I keep a thermometer in there all the time, and of course the temp varies during baking but doesn’t get over the proper temp. There is no problem using it for other types of baking, including your old bread recipes, which rose during baking. Could it have something to do with the xanthan gum being overworked by the mixer? Could I be handling the dough too roughly during kneading? I try not to do that. Could the problem be only with the lean bread? I haven’t tried other recipes yet. Are these new recipes more sensitive than the old ones? Sorry to be so picky. Just trying to get the results I read about from others. It sounds like you aren’t using a light enough touch when shaping the bread. A light touch is truly key, which is why it’s repeated in the General Shaping Techniques in the book. I recommend you watch the bread shaping videos I did and I embedded in this post from youtube.com. And try my earlier recommendation of preheating the oven low. I’m glad you’re sticking with it. Please rest assured that the recipe is one of the most well-tested in the whole book, and will work when done as written. Good luck! Watched the video, and my dough was not that light or smooth looking . Maybe it’s the difference in the recipe. I will try again, this time with an extra light touch. Thanks for your help. I really want to make this work! Green, this is my last suggestion as I really have to run: Be sure you are measuring your ingredients by weight, and it sounds like you are incorporating too much flour into the dough when you are shaping it (without using a light enough touch). As the troubleshooting section states, please try leaving it to rise longer in the refrigerator (even try going to 5 days), which will make the dough less sticky as it will absorb more moisture. That way, you should be able to shape it properly with a light touch, and without incorporating much flour into the dough during shaping. The lean crusty white sandwich bread dough should be smooth after shaping (it is what you see being shaped in the step by step photos of sandwich bread shaping in the book). If you add too much flour, you will end up with a dough that doesn’t really rise much (which would explain why it rose before shaping but not after) and has a dense tight crumb. Please read carefully through the troubleshooting section. I believe that all of your answers are right there. I’ve got to run, but good luck! Quick question about Powdered Pectin. There are a few different kinds on amazon. Is this one ok to use? I love the book! Have them all. I just got my expandex this last weekend. I had started the sourdough starter and yesterday was the day to make it into a mother starter. It did not rise much. Insteat it is a mealy textured lump which does have some lift but will not double. I expected it to remain elastic. Do you have any idea where I went wrong? I am familiar with a sourdough started that stays liquid so I do know the mixture was active. Hi, cornies, as the book explains in that chapter, the mother starter will become more and more active over time, as it is refreshed and rebuilt. If it did not double, or come close to it, then I would imagine that is a combination of a proper proofing environment (it really does need to be warm and moist) and/or enough time. Don’t be afraid to let it sit for longer. A wild yeast sourdough starter is something that, once you build it properly, you will have for years to come, so let it do its thing! It’ll be worth it in the end. I am concerned that it is so crumbly (almost dry). Should I to the steps to refresh it even tho I just made it? cornies, I’m afraid the only reason I can imagine that it would be dry like that (an experience I’ve never had, and I’ve made this at least a dozen times, from start to finish) would be if your measurements were off. I’d check that, and be sure you’re measuring everything by weight, including water – and zeroing out the weight of the jar as you go, as described in the instructions. And use bottled spring water, not tap water, as described in the instructions. Good luck! Read the book cover to cover last night on my Nook! SOOOOO excited to get started!! Thanks so much for including info on where to order the Expandex and Whey Protien Isolate! Wahoo! got my copy Kindle yesterday. Just waiting for the whey protein and I had to get the ultratex 3 since there was NO! expandex unless I wanted to buy a 5 lb package. I know I may end up there but right now that wasn’t in the budget. I’m looking forward to making some lovely Pannatone and bagels to start off with! Thanks NIchole for making these things possible again. :) (I have all your books on my kindle and I am getting my money’s worth out of them for certain!! Having hot dogs for dinner tonight. My daughter is excited to have her own bun:). My dough is rising in the refrigerator now! Hi, Candice, I’m afraid I haven’t tried that, so I don’t really know. I don’t generally like giving bread dough a chance to do a second rise in the refrigerator, as you really run the risk of its overproofing once you allow it the final rise. Maybe try half a recipe, in case it doesn’t work out well? Is it possible to use an egg replacer or flax eggs in your bread recipes? Or at least most of them? I can’t use them due to allergies to eggs. Please advise. Thanks! Hi, Shruti, I’m pretty sure I answered this question of yours elsewhere. Most of the recipes in the book do not call for eggs, unless they are there traditionally (like in brioche). Just finished putting my first dough into the ‘fridge to rise overnight. You weren’t kidding! This is a COMPLETELY different kind of gf dough – like from another planet kind of different! I LIKE IT! No…I LOVE IT! What I really love is that, after following the blog for so long, I have some great techniques in my “tool box” that make the bread making SO much easier, and enjoyable! My dough was ready to go, kitchen cleaned, and me on the couch with a cup of tea and a gf cupcake in less than an hour. Thank you, Nicole – and everyone on the blog – for making GF something I want to do, not just something I have to do. UPDATE: First loaf out of the oven and taste-testing complete. “Looks like bread, tastes like bread, eats like bread!” says the boyfriend. It did come out rather dense, and very crusty. I’m calling it an oven defect. I used an internal probe for the last part of the baking, but it took WAY longer than 10 minutes to reach 195 degrees…I assume that explains the super-crusty texture. Just finished putting my first dough into the ‘fridge to rise overnight. You weren’t kidding! This is a COMPLETELY different kind of gf dough – like from another planet kind of different! I LIKE IT! No…I LOVE IT! I’ve been checking Amazon in the UK for days and its still not taking orders. I couldn’t wait any longer – even though I know I have an Amazon gift card coming in the next few days. I’ve ‘hit the button’ and ordered from the US site. I hope it arrives before the new year. I can’t wait to try some English Muffins. I have been asking my editor to see what she can do, and for some reason there is apparently still a delay on the UK site. So sorry you ordered from the U.S.! Since you won’t find Expandex in the US, try ordering Ultratex 3 and following my information on this page on the blog (scroll down), phoebe! I love the book!! I have tried two recipes so far with great success, one of which is the cheese bread above. You’ve done all the work, and I’m truly grateful!!! I’m so, so glad, Janet!! That cheese bread is the living end, as far as I’m concerned. Thanks so much for letting me know about your successes! I have been out of town on business but now I’m baaaack! THANK YOU for all you do – you are the best GF baker, recipe developer, blogger, cookbook author, etc…. that I know – YOU ROCK IT GIRL! Yay! Congrats on your amazing book Nicole. I have your recipe of crescent roll dough refrigerating right now!! Haven’t had them in years…can’t wait to make them! Just a quick question since i don’t have a facebook or twitter account. Can you halve the recipes in the new book? You only mention the Monkey bread recipe to half. Hi, Samantha, you absolutely can halve the recipes! You’re right, I do mention that with the monkey bread since it’s a whole lot of monkey bread to commit to, but yes, you can halve any of the recipes right down the middle! Very anxious to try the recipes, but very disappointed I can’t buy expandex anywhere on the planet. I’m not even on a backorder list. I order a lot from Vitacost.com, and they happen to sell Better Batter and several brands of whey protein isolate. I submitted a request to them to see if they will carry Expandex. Then we can get all three items from one place! They are looking into it, which is very encouraging! Try contacting your favorite local or online retailer. They are often very willing to stock items requested by customers. Direct them to this web site and let them see for themselves that this is a “hot” item! I didn’t know that Vitacost packaged anything, Donia. That is great. I will contact them myself as well. Let’s all contact them to show them the demand is there! I have tried King Arthur Flour, nuts.com, Bob’s Red Mill and Better Batter. So far, Better Batter is the only one interested, but it’s slow going. Apparently, they are researching packaging, I think. Email them, too, to show the urgency! Thanks a million, Donia! It looks like TailorMade Nutrition in Woodbury, MN may still have it in stock for online orders. Worth a try! Anneke, you’re the best. I just contacted TailorMade by phone and they’re sold OUT! (sorry – that would be because of my book) But they expect to get in more next week, and the manager is going to call me early in the week to give me more information. Yay! More sources! They are a great store, very helpful people! Sandy, I understand you are frustrated. I am doing everything I possibly can do to help make more Expandex available. Please see the resources page on the blog. I believe Rheinlander Bakery has stock and you can order online from the link I provide. OK… STILL waiting on my expandex back order. While I know I will need it to have a wonderful loaf of bread what will happen if I leave it out??? Will I lose taste, texture, or “fluff”?? At this point am getting so impatient to try a few recipes from my new book am willing to make an attempt. Making cheesecake cookies for first time for work cookie exchange and will be done night before. Can anyone tell me should they be refrigerated after baking/cooling? I love this book. I’ve started making bread! I do have some confusion though. If we use a premixed flour like better batter do we still need to had the expandex? Yes, Diana. Please see the recipe for Gluten Free Bread Flour on the top of page 8 in the book. It is a combination of all purpose gluten free flour + whey protein isolate + Expandex. You need all 3 elements. Better Batter can be used as the all purpose gluten free flour, as explained on page 8 as well. That looks amazing, Diana!! I love it! The perfect color, perfect crust! Thanks so much for posting the photo! Thank you, it tastes amazing. Thank you for writing the book. Cannot wait for Christmas! My copy of the new book better be under the Christmas tree! Thanks for so many successful recipes…so happy to share your tasty and delicious cakes, cookies, and now bread with my friends and family! I could have saves money and waited to buy the book…..LOL. Thanks for the tutoring, I need the fine tuning. Heather, if they started to fall apart during baking, they were too wet. Be sure to measure your ingredients by weight (including water, for extra precision – 1 fluid ounce of water weighs 1 weighted ounce, or 28 grams). And as I explain in the troubleshooting section, if your dough is too wet, let it rise for longer in the refrigerator during the first rise. The flours will absorb more moisture and make the dough easier to handle. That, and be sure to follow the shaping instructions precisely, and be sure to grease the surface on which the shaped bagels rise or you will tear them up when you try to lift them up to boil them. My guess is it was a combo of those things. I think your oven wasn’t hot enough, as well, if they took 50 minutes to bake – or it could also be that your dough was so wet. Good luck! I can’t wait to make that cheese bread and there are a bunch of other breads in the book that I’ve got my eye on, too. I just have to get the missing ingredients asap! Many years ago I baked most of the LaBrea Bakery’s breads (before I was GF) from Nancy SIlverton’s book, and I can’t wait to try and recreate them as GF!! Sounds like you’ll be able to hit the ground running, Brad! We started with the lean crusty white bread…followed your directions to the ‘t’…or so I thought. The bread did not turn out right, but I think I narrowed it down to the baking time. When the book describes to put the bread in a cold oven, set to 350 and bake for 30 minutes…does that 30 minutes include the preheat time? Or are you supposed to start the 30 minutes once the oven has come to temperature? Thank you so much for your insight with this…we are looking forward to trying again! Hi, Bella, It’s just what it says, a cold oven. You read it right, but you didn’t finish reading. ;) After the 30 minutes, remove the loaf from the pan, place it on a baking sheet and then continue to bake it until it sounds hollow when thumped on the underside and the internal temperature of the loaf reaches about 195°F on an instant read thermometer (about 10 minutes more, but it will depend). Also be sure you are using an oven thermometer. Most ovens are off by a lot! Thanks Nicole…I do have an oven thermometer…but I think what I wrongfully assumed was to start the 30 minutes once the oven was at 350…then bake the extra 10 minutes after the removing from the pan…so in essence, I baked the bread probably another 10-15 minutes extra beyond what I was supposed to. I’ve got the English Muffin bread in the oven right now…can’t wait to try it. Thank you for your response! No, Bella, start in a cold oven and set a 30 minute timer. Then remove from the pan, and return to the oven to finish baking. I made this one too! I was confused on the timing as well, but it turned out pretty good. Now I need to mix more flour but I’m using better batter and don’t know if I still need to add the expandex. I responded to you above, Diana. I’m waiting until after Christmas to get a kitchen scale… I ‘m trying to convince myself that the enforced tortured waiting is good for me. Otherwise I’d be trying to make all of these at once. Now I get to drool/dream a bit and make whatever I end up deciding I want most. Get the scale! Don’t wait! I am clicking on the collage and getting taken to outside links, such as Amazon when I click on English Muffin bread. Anyone else having this issue? Guess I should have read the posting before clicking! Oh, and I’ve made the English Muffin Bread, twice! It is fantastic!! Such a favorite of mine. So glad you love it! I think you mean “loaded with Cheddar cheese,” not “lousy,” right? Haven’t made that one yet, but it can’t possibly be lousy in any way!! Congratulations on finishing the big week! Now to rest up by baking some cookies! Nice catch, Anneke! Spellcheck must have really been confused! And Mel’s from Minnesota, so awesomeness just built right in! I’ve got lean white bread dough in the fridge right now. I only made it yesterday morning, but I think it’s time I get it out and play with it!! My fridge currently only has room for one bowl of dough, and I’m anxious to make another already! I am going to rest up by making cookies, in fact!